If you're a morning person like me, we all appreciate those extra few "give me five" minutes. Yes, the ones that seem to only last 10 seconds. Then realising that you have limited yourself half an hour to prepare for a full day. I have in no means mastered the art of beauty sleep, so I have resorted to various skincare products throughout the years to fake the additional shut-eye that I did not feel like taking at the time. the narrowing down comes after. Being in college also meant that I had no spare time to try-before-you-buy. That is until my mum came home with tiny tubs of No7 skincare samples. Deciding to have a tester week, I swapped all my usuals for the samples. I have not looked back again, I was so pleased I even went to the consultant, who advised my mum, to thank her profusely. So I thought to share my opinions on the two No7 products above (picture) with you, to save your skin from feeling and looking like it's been in the sauna for a few too many hours. No7 Beautiful Skin | Melting Gel Cleanser for Normal / Dry Skin 150ml (click here if you're in the US)Although it does sound slightly fit for the "House of Wax", it's no horror story. I use this in the morning and at night, does not fail to help me feel refreshed (guess that's not good when I'm heading to bed though). 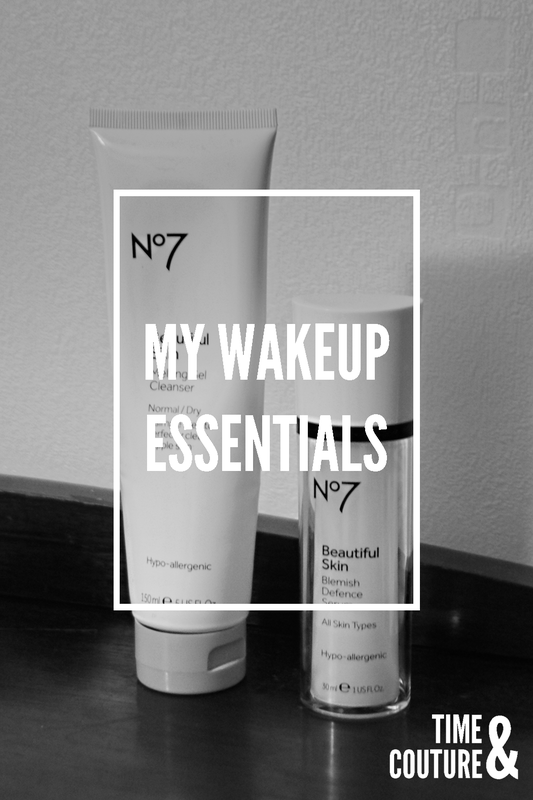 I had been using another No7 cleanser which kept on making my face dry and taut in a bad way. When I switched to this gel cleanser, the difference was almost instantaneous. My skin felt and looked as supple and clean as the description promised. The hypo-allergenic element of the No7 brand agreed with my skin and did not produce red blots all over my face like the previous one did and the gel quality of the cleanser kept my combination skin moisturized (feels like you're putting on a face mask). If you have combination skin like me ('cause you're skin couldn't decide what it wanted and decided to be greedy), I would definitely, no questions asked recommend this product. It helped to balance the oils my skin produces, so that it doesn't clog up my pores. I don't normally put heavy makeup on, so I'm not sure how well it'll do in that department. At £9.50 (USD 8.49) , it won't break the bank but better make like my mum and ask for a sample. One thing I would strongly advise is, do not put it on hold. Don't break your routine, as I did when I had one of those moody mornings and could not be bothered. Let me tell you, it was my skin that took the fall for my laziness. I put this on mostly in the mornings, after using the above cleanser and before moisturising (I'm still on the hunt for the one). This is my substitute for a toner and it firms my skin and places a sort of invisible mask on your face to prevent spots appearing due to the moisturiser. I was using my mum's toner (we have similar skin properties) before this, which didn't stop my skin from breaking out spots during the day. The serum gave a smooth touch to my skin and kept the dirt and dust away from my pores. Unlike the gel cleanser, the Blemish Defense Serum is suitable for all skin types, I can testify that it works for mine. I'll recommend it to everyone who's looking for an alternative to their daily toner, by all means try both at the same time (not sure how that works or which goes first but...). For £16 (USD 16.99) you get 30ml of this translucent potion. It's more pricey than the cleanser but I'll say it's worth it. Again take the time to try a sample with your other daily essentials, see how it goes from there. Clean hands! I can't stress this enough. If you're using the same hands that held your breakfast, checked your emails and typed your correspondences, go wash them now! At least before applying the serum and everything else that goes with it. Just imagine all the dirt, dust and pore-clogging material locked and sealed with your skin under that mask-like serum. You can't blame that on any products (unless it's that year-old, bacteria-infested moisturiser that you can't seem to let go). Despite my opinions, it's up to you (or your skin) to decide what works for you and what doesn't. Don't go ahead and buy something without firstly doing some preliminaries (yes, even if it's me who's recommending them). Treat your body like a temple, and all that jazz (which basically means don't destroy it, we don't destroy temples). I'd love to know how it goes, please comment down below. P.S. Can any of you recommend a good moisturiser for combination skin types? No tinted ones please. P.P.S. For those of you living in England, there's been a 3 for 2 offer going at Boots, which covers the products that I reviewed.